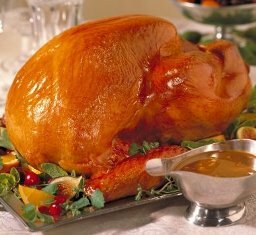 is called stuffing or dressing regardless of whether it was cooked inside the turkey or not. So the answer is simply a matter of choice. Refrigerate any leftover turkey and stuffing separately. Don’t store leftover stuffing in the bird! 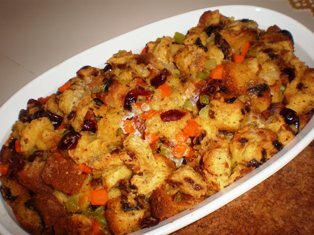 These stuffing/dressing recipes are not only delicious with turkey but make a great side dish for chicken, ham, or pork roasts. Preheat oven to 350 degrees F. Cut cornbread into 1-inch cubes. Place the cubes on a baking sheet. Bake until slightly dry and brown, about 20 minutes. Cool on baking sheet. Butter a 13 x 9 x 2-inch glass baking dish. Melt butter in a large skillet over medium heat. Add the onions, celery, carrots, sage, and thyme. Saute until tender, about 12 minutes. Transfer mixture to a large bowl. Mix in the walnuts and cranberries, then the cornbread. Stir in 1/2 cup broth, eggs, salt and pepper. Add more broth until the mixture is evenly moist. Transfer stuffing to the prepared baking dish. Cover with foil. Bake 40 minutes. Remove foil and bake 20 minutes longer or until brown on top. Slice the Italian bread into 1/4-inch slices. Arrange them on a baking sheet and bake until dry, 10 to 12 minutes. Allow the bread to cool; transfer to a food processor and chop to coarse crumbs. You should have about 1 cup of breadcrumbs. Set aside. Bring the chicken broth to a boil in a medium saucepan. Add the orzo and cook 8 to 10 minutes, until tender. Drain, reserving the stock. In the meantime, melt the butter in a skillet. Add the onions and sauté over medium-high heat for 5 minutes. Add the mushrooms, celery, red pepper, and oregano. Continue sauteing about 4 minutes, or until the mushrooms are brown and tender. 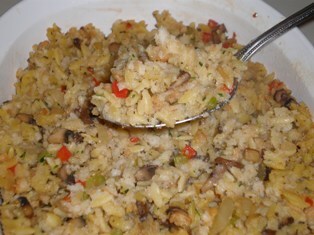 In a large bowl, combine the breadcrumbs, orzo, vegetables, and parsley. Stir gently to combine the ingredients. If necessary, add some of the reserved broth to moisten the stuffing. Season with salt and pepper. If you are going to bake the stuffing in a baking dish, drizzle the top with a bit of olive oil, cover, and bake for 20 to 30 minutes at 350 degrees F., just to heat through. 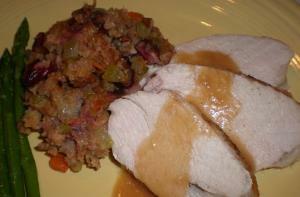 This is a really delicious stuffing ... the flavors are very complex. I use Pepperidge Farm Country Style Stuffing Mix, which has a combination of white and whole wheat bread. You can also cut a loaf of country-style or sourdough bread into 1/2 inch cubes and bake in a 350 degree oven for 20 minutes to dry in place of the packaged stuffing mix. This stuffing may also be made without the sausage and it is still very good. Preheat oven to 350 degrees F. Butter a 9 x 12-inch baking dish. Put the bread cubes in a large mixing bowl. Heat oil in a large skillet over medium-high heat. Add sausage; cook until brown, breaking up the large lumps, about 5 minutes. Add butter and allow it to melt. Add onion, fennel, celery, thyme, sage, salt and pepper. Cook until the vegetables are tender, stirring often, about 5 minutes. Add the apple and cook 2 more minutes. Transfer the sausage-vegetable mixture to the bowl with the bread cubes. Toss to mix the ingredients. Add the chicken broth and eggs to the bread mixture. Toss to blend well. Add more broth or water if the mixture is too dry. Transfer the stuffing to the prepared baking dish. Cover with a sheet of butter foil. Bake for 40 minutes. Uncover and bake until brown and crisp on top, about 30 minutes. This stuffing has a slightly sweet flavor and wonderful aroma. Don’t add too much broth to moisten it or can get very mushy. Spread the panettone cubes on a baking sheet in a single layer. Bake for 10 minutes, stir the bread, and bake for an additional 5 minutes. The bread should be slightly browned and crusty. Cool the bread on the pan on a cooling rack for at least 30 minutes. Melt the butter in a skillet over medium-high heat. Add the celery, carrots, and onion. Saute the vegetables for 6 to 8 minutes, or until they are starting to get tender. Stir in the dried cranberries, salt and pepper, and thyme; sauté for another 2 minutes. Transfer the mixture to a large bowl. Add the chicken broth, a little at a time, until the bread mixture is moist but not soggy. Transfer the mixture to a buttered baking dish. Cover the baking dish with foil and bake for 20 minutes. Remove the foil and bake for an additional 10 to 15 minutes. The stuffing should be heated through but not dry and crusty. Buckwheat is a fruit and not a grain. As such, it is wheat-free and gluten-free. It is one of the best plant sources of protein and has a slightly nutty flavor. 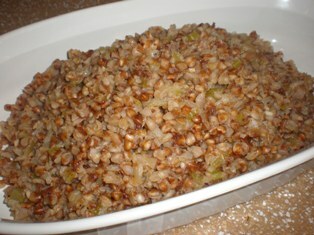 Buckwheat is a commonly used in pasta in the Lombardy region of Italy. Purchase buckwheat that is labeled as whole buckwheat groats or whole kasha. Kasha is buckwheat that has been roasted. You can use either in this recipe. Melt the butter over medium-high heat in a wide saucepan. Add the celery, onion, and garlic; sauté 2 to 3 minutes. Add the kasha, stir to blend, and sauté for another minute. Add the broth, salt and pepper. Bring the mixture to a boil, reduce to a simmer, and cover. 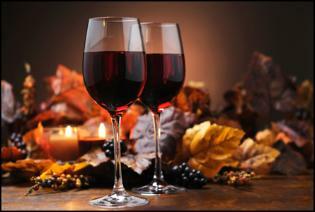 Cook for 12 to 15 minutes, or until the liquid is absorbed and the kasha is tender. Fluff with a fork and serve. This stuffing does not have to be baked. If you make it ahead of time, spread it in a buttered casserole, and cover with foil. Bake it at 350 degrees F. for about 30 minutes, just to heat through. If you’ve ever found yourself stuck in front of the stove at your own party, scrambling to get everything to the table at just the right moment, Ina is here to let you in on her secrets! The perfect tool for preparing fresh purees, sauces, soups and more. Designed to grate more cheese in less time, while being more comfortable to use. Works swiftly to press the maximum amount of pulp and juice from cloves of garlic. 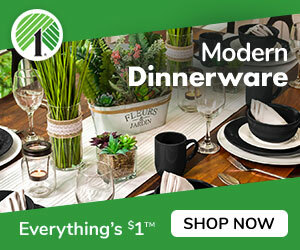 This collection includes 10 essential cookware pieces. Each pot and pan has a strong copper-infused ceramic coating that creates a non-stick and scratch-resistant cooking surface. Your food won’t stick and cause scratching to the ceramic coating. When seasoned as per package directions, your food will slide right out of the pan! No scrapping, no scratching needed. Little to no oil, butter, or grease is needed while cooking, allowing you to cook healthier home cooked meals.